Robotic welding systems have been widely used in large-scale automated manufacturing facilities, particularly in the automotive industry, for a number of years. Faced with cost-down pressures from their customers, small metalworking job shops are now starting to consider implementing automation. When the operating costs of robotic welding are compared to manual welding the results are now clearly in favour of the robot. Additional benefits of automating are increased productivity, more consistent welded joints and improved quality. Cyber-Weld, a Warwickshire, UK-based provider of robotic welding solutions, provides a simple cost analysis to its potential customers. Using manual welding, the overhead burdened cost is around £35k PA for a single shift, with an average ‘Arc On’ time of 25%. The average robot ‘Arc On’ time is 75%, three times that of a manual welder, resulting in an additional 200% production capability. With an entry level robot and operator costs of £17.5k, the payback time is less than 12 months. Potential users do have concerns though. How easy are they to programme? Where to find trained staff to operate them? How reliable are the robots? 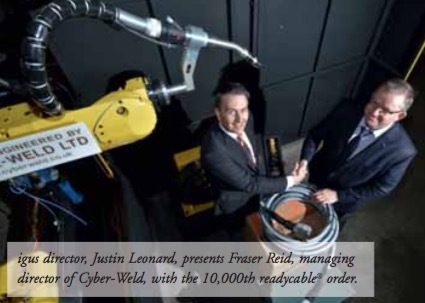 Cyber-Weld regularly uses igus® as a supplier and partner for cable assemblies on its robotic welding machines for the same reasons and has bought over 100 readycable® drive cables. Cyber-Weld’s last purchase marked a milestone for igus®; being the 10,000th order for the product series. These highly flexible cables provide power and signals to the robotic head, grippers or other attachments and are usually mounted externally to the robotic arm. Particularly on a six- axis robot, this cable is subject to a great deal of rigorous movement, which can lead to premature failure if incorrectly specified. The readycable® assembled drive cables series has bending radius from 7.5 x od. Harnessed cables are tested in igus® e-chain® cable carriers through many millions of cycles.There is a choice of servo cables, signal cables and feeder cables with a total of seven cable quality levels for the same electrical requirement, offering an affordable and durable solution for all applications. The readycable® assembled drive cables also have a number of certifications and regulatory conformities including UL, CSA, CE Desina. These extremely reliable cables are designed for high stress applications and are also available with flame and oil resistance. It is no contradiction to say that good cables cost less. Fast delivery throughout the world is a significant purchase criterion, and igus® can provide that with a presence and stock in more than 40 countries. This saves time, money, part storage capacity and is applicable to 1,040 igus® cable types, which can be ordered without any minimum quantity purchases or surcharges. extensive data-base, providing precise and reliable data about actual service life. The test data for e-chains®, cables, and also for ready-assembled systems, are so extensive that igus® has secured a functional guarantee for its variety of e-chain® systems based on the particular application. The igus® reputation appreciated by Cyber-Weld comes from this extensive testing and more than 25 years of industry experience in continuous-flex cable. Further information and the on-line readycable® product finder can be found on the igus website, including searches by machine producer and cable type. Based in Northampton in the UK, and with global headquarters in Cologne, Germany, igus® is the largest producer of injection moulded polymer bearings and reinforced plastic cable carriers in the world. Product lines include industry-leading e-chain cable carriers,chainflexcontinuous-flexcables,iglidur® plasticplainbearings,igubal® sphericalbearings,drylin®linearbearingsandguide systems. The company has 26 subsidiaries across 31 countries and employs more than 2,150 people worldwide.